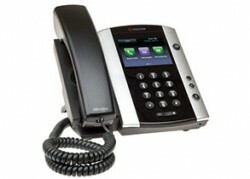 IndyVoIP Phone Systems by PcComputerGuy, Offering Enterprise-Tier Systems with a residential price tag. It’s important to give a professional impression in our daily business – and our hosted VoIP solution does just that. Supporting HD Audio for crystal clear conversations, superior to that of traditional telco (POTS) lines. Instead of clients hearing the classic “ringing” sound when calling, our systems can be easily programmed to advertise your business. Incoming calls can be sent to any number of phones, including cell-phones so that you can always answer calls. Should you go on vacation, re-routing calls to another number can be done in seconds. Auto Attendants allow callers to select from any options you want to provide; for example “press 1 for sales, 2 for service”. All these features and more often cost less than you currently are paying for phone service. Cloud based VOIP systems also remove the need to maintain expensive on-site PBX equipment and phone lines. No longer will it be necessary to invest in costly and time-consuming upgrades as that’s all handled for you in our cloud-system. With our VoIP solution there is no cost for individual “lines” as is the case for traditional phone systems giving you the ability to handle virtually an infinite number of calls at no additional expense. Get more quality, features and support for less with IndyVoip. Get the highest-rated Cloud voice platform. Our cloud-powered phone systems rate highest on third-party customer review sites. Power your phone system with world class technology, and give yourself the professional look and feel your customers expect. A fortune 500 system, without the fortune! 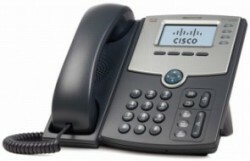 Many of the powerful phone systems used by companies require very expensive PBX equipment. These systems are expensive to maintain, and difficult to program. Our VoIP solution is affordable and so easy – you can manage it yourself! We’re not afraid to give you our pricing up front like many of those other guys – because we know we offer the best bang for your buck! Often our VoIP solution provides MORE and costs LESS than your current PBX setup. 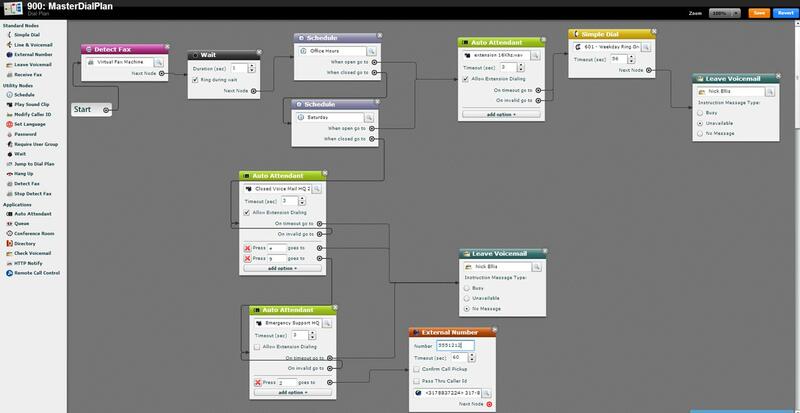 Programming of the system is done through an intuitive web interface with drag-and-drop blocks to handle advanced options. If you can imagine it – odds are we can do it. Changes you make through our easy to use website happen instantly. You don’t need a hundred page manual to setup our system. We stand by the quality of our service and even offer disaster recovery – external number automatic re-routing in case of internet failure. 97% of our current customers would recommend us to a friend. Our pricing is straightforward and you'll never get hidden fees. While many companies nickel-and-dime customers for features such as voicemail, IndyVoip Packages are all-inclusive. Whether you need one phone or 100, you will enjoy all of IndyVoIP’s features which are aimed at productivity and easy-to-use. Amazing Features available with an easy-to-use web interface. From Auto-Attendants to that Time-Based Routing, our VoIP systems are fantastic. IndyVoIP offers a bounty of features to help you stay productive. Companies will enjoy the PA and call forwarding abilities. The auto-attendant is perhaps the most powerful feature, and is included with all packages. Included in all pages are: Unlimited domestic calling, Free 24/7 US-Based customer support, Simul-Ring, E-Faxing, Multi-line support, and So Much More! In addition to the 24/7 call center, our customers may also choose to utilize PcComputerGuy's award-winning on-site support. 97% of our current customers who would recommend us to a friend. IndyVoIP is unique because our parent company PcComputerGuy has established a broad and loyal customer base through outstanding customer service and a unique ability to assess customer needs and tailor every service, from computer repair to VoIP systems, to perfectly suit customer needs. We don’t just want to push a phone system on your company. We want to ensure it will work well for you, fits your needs and provides the features and quality you demand. To this end, we will setup up to 4 demo phones for you to try for a week. 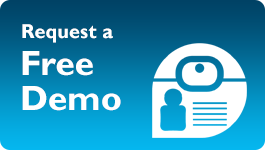 There is no cost or commitment required for this demo – we are just that confident you’ll love it. *Must be looking to order at least 3 devices for the free on-site demo. A Virtual PBX is a phone system that is hosted in the cloud. 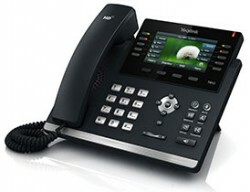 Normal PBX systems require servers and other phone equipment on-site that connect to a limited number of phone lines you pay independently for. You are responsible for maintaining, updating and repairing these systems. With our virtual PBX (phone system), all that hassle, updating and costly maintenance becomes our responsibility. All you need to do is have a phone, and a reliable connection to our system and you’re good to go. It doesn’t get easier than that! 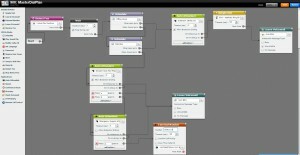 Drag and Drop Dial Plan Editor is light-years ahead of complicated, difficult to use PBX systems. Simply drag and drop the items you cant onto the page, then connect the dots! Unlimited Minutes Domestic Calls to Lower-48 states. Top-Rated company on AngiesList and winner of the “Super Service Award” every year since 2010. We were apprehensive about making the change to VoIP. We had a traditional old fashioned POTS system that people had become very accustomed to. Nick held our hand and walked us through the entire process. Now we have a better, more reliable phone system, with newer phones, that actually costs less money. Nick was also able to set our router up so that we could utilize 2 different ISPs, in case of an outage, which made increased our reliability even further. We have been using IndyVoIP for years now and love it. Previously we had Vonage – which worked fine but provided none of the advanced features and cost more. We then switched to Ring Central – and found the call quality and customer service lacking. With IndyVoIP – we now have great call quality, reliable phones and tons of features that help us present the professional, above the competition feel we were looking for! Copyright IndyVoIP | All Rights Reserved | 317.732.8647(VoIP) - IndyVoIP is a registered Jive Partner.